"It is a crime that not every parent has the same choice that I do," Fine said. "Parents, we are going to be here for you because they are your children, they are not the state’s children and they are not the school district’s children," Donalds said. SB 7070 would create the proposed "Family Empowerment Scholarship," which would expand eligibility to students with household incomes exceeding the federal poverty guideline by up to 260 percent – $67,000 for a family of four. It would be capped at 15,000 students statewide "with the ability to grow as the overall public school student population grows" and earmark general fund revenues to supplement FTC revenues in paying for the vouchers. 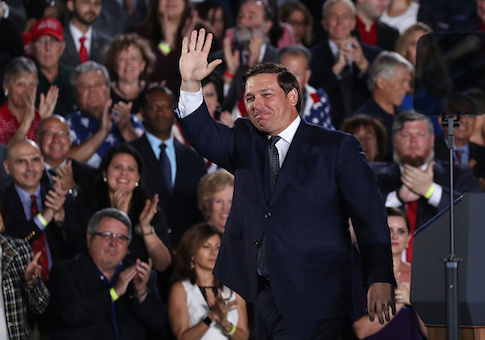 DeSantis’ proposed "Equal Opportunity Scholarship" would grow the FTC scholarship program rather than use general fund money to make students whose family household incomes exceed the federal poverty guideline by up to 265 percent, up to $68,000, eligible for school choice vouchers. "House Republicans are abusing the legislative process to rush this bill through because they know it would never hold up under sustained scrutiny," Florida Democratic Party spokesman Kevin Donohoe said in a statement. This entry was posted in Issues and tagged Ron DeSantis, School Choice. Bookmark the permalink.